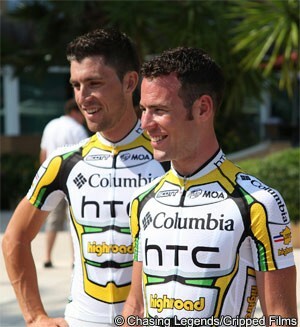 US cycling team HTC-Highroad starts the Tour of Qatar today in Doha celebrating 400 wins since its start in 2008. "We are all thrilled to hit the 400 victory milestone and to continue our success together," said team owner, Bob Stapleton in a press release. Ellen Van Dijk gave Stapleton win number 400 when she won the overall classification of the women's Tour of Qatar Friday. In late 2007, after working with the women's team, Stapleton took over management of the men's German team, T-Mobile. T-Mobile had been affected with several doping scandals in 2006 and 2007. Stapleton, however, restructured the team and started it as a US-based team, Highroad in 2008. Stapleton helped to fund the team before finding title sponsors Columbia sportswear (June 2008 to December 2010) and HTC telephones (June 2009 to present). Mark Cavendish has been the team's star rider in recent years thanks to his sprint dominance at the Tour de France. The team, though, has won in many races, from the spring classics to Grand Tours. "We remain an open team where success is possible for all. Seventy five percent of our athletes have won races over the last three years. Each rider has a chance at victory by staying personally focused and racing as a team every day in every event. It's the combination of exceptional people, partners and shared commitment that sets us apart." Van Dijk's overall win at the Tour of Qatar brought the count to 400, 241 from the men and 159 from the women. "I'm proud of what the team achieved is such a short time. It is the mix of good people who make this team such a big success," said Team manager Rolf Aldag. "Looking forward to make it 500 during the 2011 season." Cavendish leads the Tour of Qatar team this week. He joins team-mates Lars Bak, Matthew Brammeier, Bernhard Eisel, Jan Ghyselinck, Patrick Gretsch, Mark Renshaw and Gatis Smukulis.